First, make sure you’re wearing shoes so you don’t accidentally step on any broken pieces of glass. Next, use a utility or chisel to remove any old glazing and metal fasteners (usually glazier’s points) that hold the broken pane. Wearing work gloves, carefully remove the broken pieces of glass. Using your measuring tape, measure the inside opening of your window frame. You’ll want to measure both the width and the height. After that, subtract 1/8″ from both the width and height measurements to make for an easy fit. 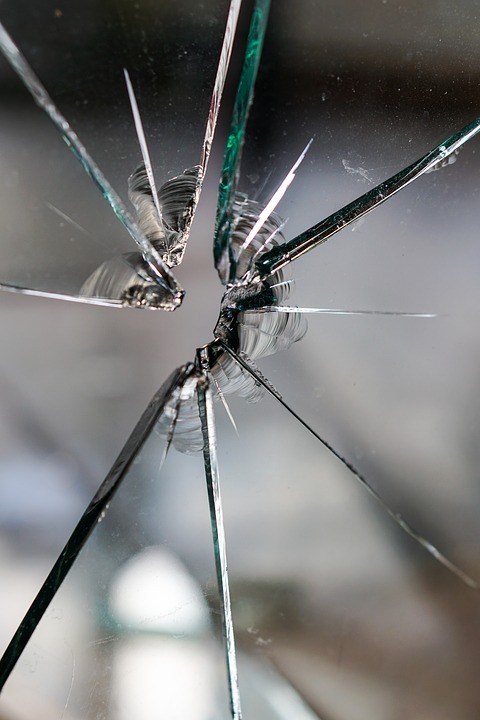 Choose a clear, strong, double-pane glass as your pane replacement and cut it to fit your measurements. You can either do this yourself with a straight edge and a glass cutter or have your local home improvement store cut it for you. Using a mild soap, water, and a soft brush, clean any remaining residue from your window frame. Let dry. Next, install a glazier’s point every six inches or so and set your glass pane into the opening. Your pane should be firmly held in place. Squeeze a bead of glazing putty in between the glass and the frame. After that, use your putty knife to smooth down the putty and let dry. Use a razor blade to cut away any excess putty. If you’re going to paint your window frame, now is the best time to do so.